How do you make augmented reality (AR) applications? For start, you can look at the features of the latest motion tracking Click board™ by Mikroe. 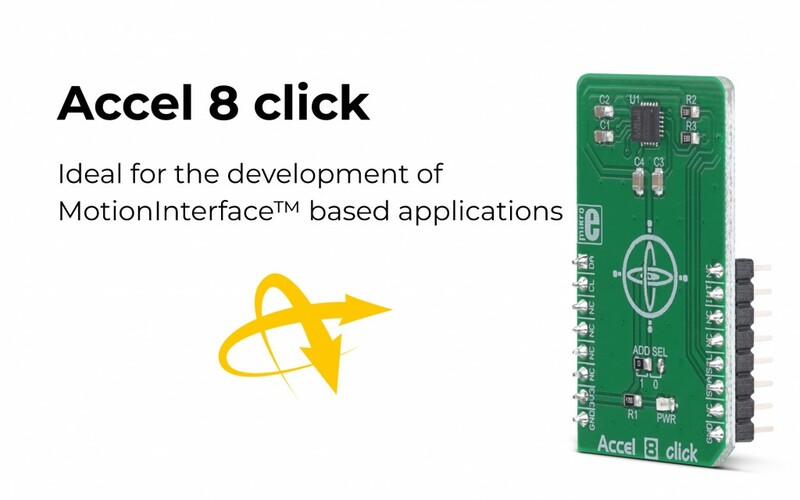 The Accel 8 click is an advanced 6-axis motion tracking click which utilizes the MPU6050, a very popular motion sensor IC, equipped with a 3-axis gyroscope and 3-axis accelerometer. The Click board™ features the Digital Motion Processor™, a very powerful processing engine, which reduces the firmware complexity and the processing load of the host MCU. The Accel 8 click is just packed with powerful options. It represents an ideal solution for the development of MotionInterface™ based applications. The MPU6050 sensor is produced utilizing the innovative Nasiri Fabrication platform, specialized in MEMS production and its integration with accompanying logic sections on a wafer level. This allows a very high integration and very small dimensions--at an affordable cost. All of these features make the Accel 8 click a MotionInterface™ enabled device. As such, it can be used for the development of different types of motion detection based applications, including gesture command, augmented reality, vehicle navigation, image stabilization in photography, and other similar applications. For more information about the Accel 8 click, please visit our website.